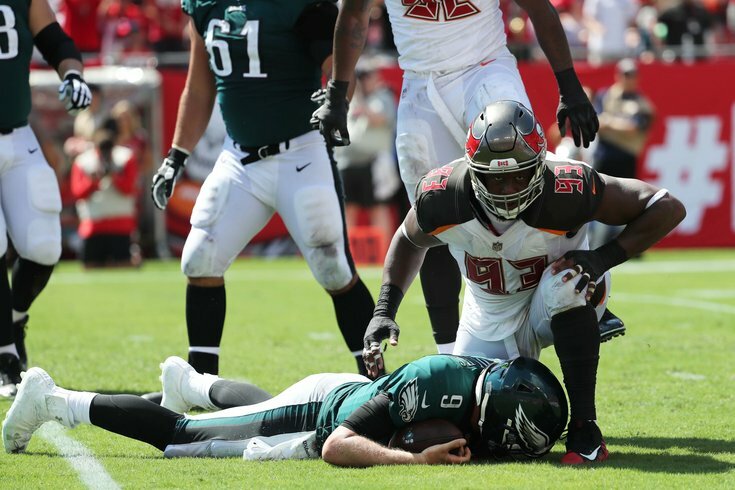 The Eagles dropped in the power rankings, so I picked a picture of Nick Foles laying face down. The Eagles are allowing a league-best 2.85 yards per rush and 58.5 yards per game. They also are posting a league-best 1.34 yards allowed before first contact per rush. #JimmySays: The Eagles' run defense ranks nowhere near the top of the list of my takeaways from the start to this season, but it is noteworthy that they have continued their run stopping success after being the No. 1 ranked run D in 2017. Held fast with the Eagles at No. 1 until they lost, but now, they drop. This is not an overreaction to the defeat in Tampa, either. Most of us thought Carson Wentz would be closer to starting by now. (He'll finally get the nod in Week 3.) No one foresaw the spate of injuries at wide receiver and running back. With Nelson Agholor bumped up to No. 1 WR and the offense going to its new TE2 (Joshua Perkins) more than normal (thanks to the blanketing of Zach Ertz, the air game is not anywhere close to championship level. Prior to Week 2, I would have said the Colts' defense, which is coming up on Sunday, would be the perfect antidote for what's ailing Philly, but then Indy went and did a number on the Redskins. #JimmySays: Yeah, I feel like there's going to be a lot of people who were just waiting for the Eagles to falter in some way so they could drop them down significantly. And yes, it is indeed an overreaction. In these rankings I often give teams a pass for playing with their backup quarterback. Just because Nick Foles got hot last postseason for a couple games doesn’t mean the Eagles don’t deserve the same benefit of the doubt. Now that Carson Wentz is back, we can start to see what the 2018 Eagles really are. They face Vikes, Panthers, Jags in October, so good idea to let Carson Wentz get feet wet now before diving into deep end of defensive pool. #JimmySays: I highly doubt the Eagles looked at it that way. #JimmySays: I'm not a big intangible guy, but I do think the return of Wentz will give the whole team a spark. Carson Wentz returns to reclaim his starting job at QB with the defending champs coming off a perplexing loss in Tampa. The Eagles look to rebound with a home game Sunday against a Colts team that probably is not as good as it looked this past weekend at FedEx Field. #JimmySays: It really wasn't that perplexing. WaPo is probably underrating the Bucs, like I was guilty of before the start of the season.